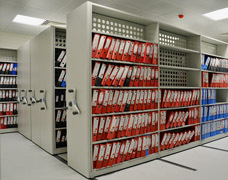 Mobile file storage systems are used to provide high density storage for file folders and lever arch boxes in offices and archive rooms to save space and increase overall file capacity. 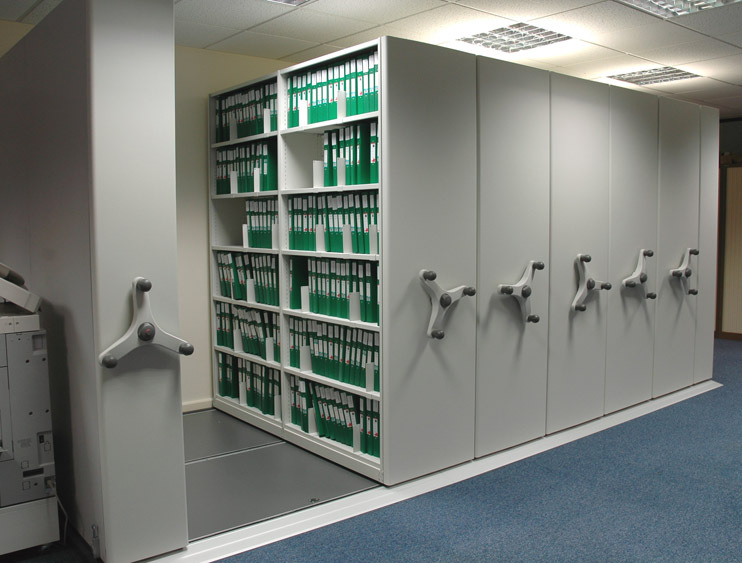 Office mobile shelving is ideal for public and private sector applications where high density storage of files and folders is required. 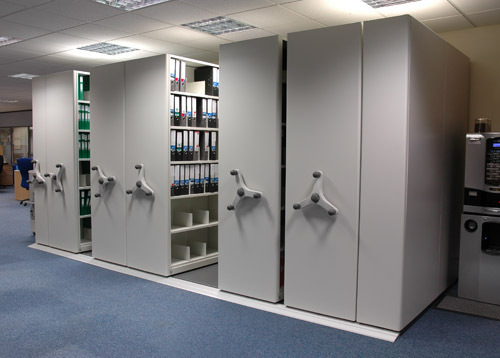 Mobile filing systems can have decorative end panels that can be finished to match the office decor, they also provide a attractive, flush finish to the end of the shelving. 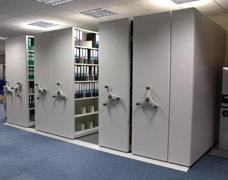 We design each filing system to suit your requirements from a wide range of standard size shelves enabling all of the available space to be used. 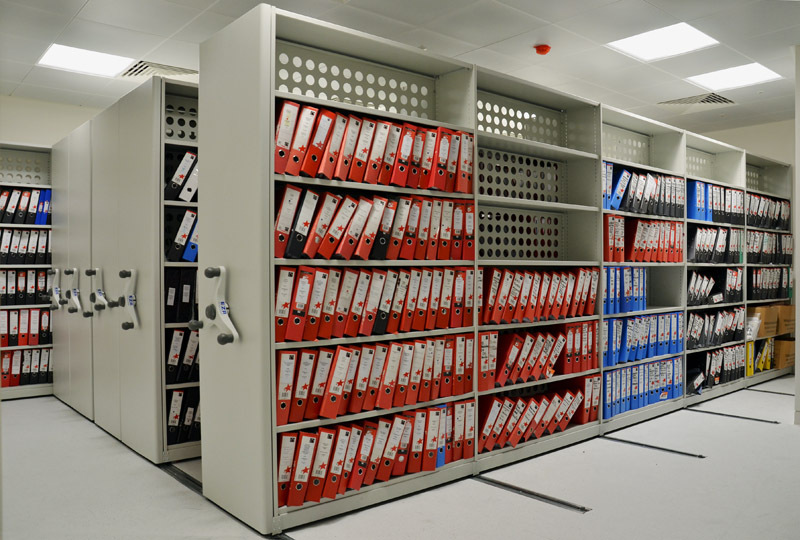 To give an indication of cost, the mobile filing system shown in the photograph below-right, has a capacity of 128 linear metres for storing up to 1700 lever arch files and cost just just £5,000. The modular mobile track system provides a flush raised floor that is supplied with a non slip finish and all mobile units are supply with safety push locks. 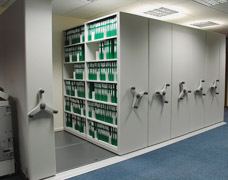 Rolling high capacity file racks can increase capacity by 100% in many applications, compared to conventional fixed shelving, freeing up valuable office space. 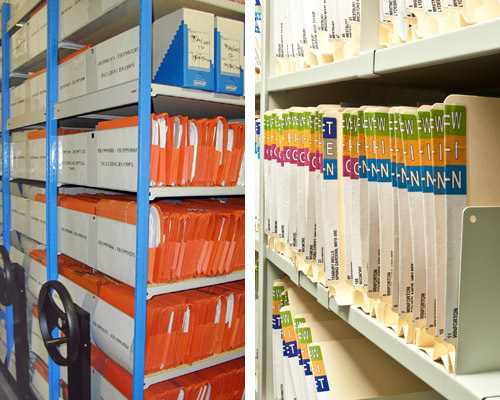 Mobile shelving provides the perfect platform to store large volumes of files and documents, high density file storage systems maximise all of the available floor space whilst retaining quick and easy access to every document. 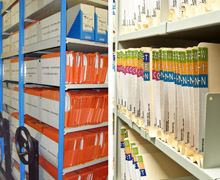 The system shown (right) utilises double-depth shelving to provide an economical solution as the same shelf is used for the file wallets on both sides of the shelving unit. The open ends provide a light and airy environment and 'bookend' shelf dividers are used to retain the document wallets shown below, doubling up as label holders. File wallets are normally foolscap size and typically measure 345mm x 245mm. The optimum bay size would be 2140mm high with 7 shelf levels and 1 bay of shelving will fit the contents of 2 four drawer filing cabinets. HR departments can benefit greatly from mobile file storage and the system can be further enhanced by switching standard file folders to personalised file pockets. These wallets are specially designed for shelf storage with an extended tab that can accept a printed label. Contact us today to find out more about our mobile filing solutions, free quotes and design service available to help you make the most of your space and budget.